More and more I see that it’s all about reading. Reading is the foundation we build everything upon. I can see it clear as day in my classes – if a student doesn’t get the reading portion, they struggle in everything else. Even math, which doesn’t need reading skills per se, is something they struggle with. 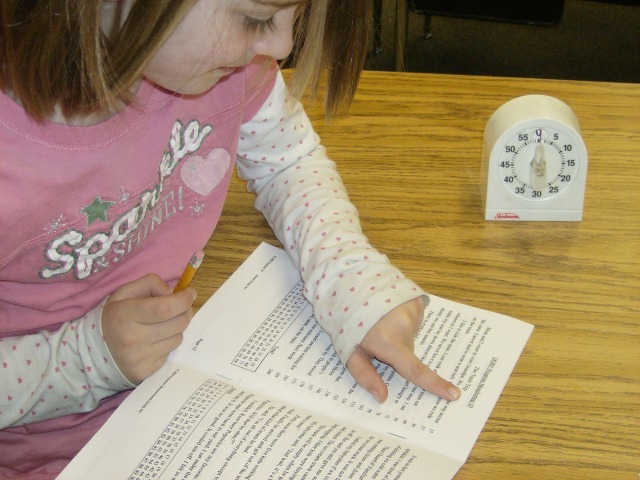 Because Math has a form of reading too – number sentences are like reading. You read from left to right, – 3 + 4 = 7. Three plus four equals seven. And that’s not even mentioning story problems. But I think it’s more than that. I think reading unlocks something in the brain. It’s like a video game, where you can’t advance to the next level until you’ve picked up enough coins or somehow aquired a weapon or magic pouch or something. You just can’t succeed until you’ve learned the reading portion of our life videogame. Teaching 5, 6, 7, 8, 9, 10 and 11 year olds reading I know that one size of instruction does not fit all. The 6 year olds especially need phonics and sentence work. They need to work on sounding out words, and getting those words so they then DON’T have to sound them out. But the 8 and 9 year olds need to start learning to LOVE reading, and I think that’s the trickiest part. You can’t teach love. You’ve got to somehow help it grow. I’m from the “work hard and it will pay off” school of thought, but you have to remember that more pushing will not make them love reading. Somehow making them realize that it’s THEM who wants to read – not just you who is making them read, is the key to unlocking the next level. All you need is patience, understanding, perseverence, and some really awesome reading material. Beautifully said! I couldn’t tell you the number of times I have known the answer to something I was never really ‘taught’ just because I read about it in one of the countless books I read between the ages of 8 & 23 (Personal reading slowed down considerably when I became a mother followed by teacher). We didn’t have a tv until I was 16 and as you know – without a satelite dish you were lucky to get 3 channels. I would add one piece to this puzzle – being read to is just as essential as learning to read. In working with the learning disabled students I have learned that too many of them are not able to visualize the story. Thus making comprehension difficult. They are used to being spoon fed the pictures through the tv screen where imagination is not necessary. Those same years I was verociously reading I also came home every day and listened to an hour and a half of radio programs designed for children. They were theatrical readings of books. “The Sugar Creek Gang” series was one of them. These programs along with my mother and teachers reading to me from the time I can remember helped to develop that mental ability to form pictures that correspond to the words being read. So along with your list I would add – turn off the tv. Well said Carmen, thanks! It’s good to remember that reading to them is also EXTREMELY helpful. It’s hard to remember that, because it looks like such a passive form of instruction, and in this WASL charged atmosphere, you feel like you’re not pushing hard enough when its you who’s doing the reading. But it’s one of those things that pays off big in the long run. After I read that, I made sure and read to the kids the very next day, and kept what you said in my mind. THANKS SO MUCH!